William Burns met interim leaders but was snubbed by rival groups, including Mr Morsi’s Muslim Brotherhood. Mr Morsi was ousted on 3 July in what many have said was a military coup. The army says it was fulfilling the demands of the people after mass anti-Morsi protests. 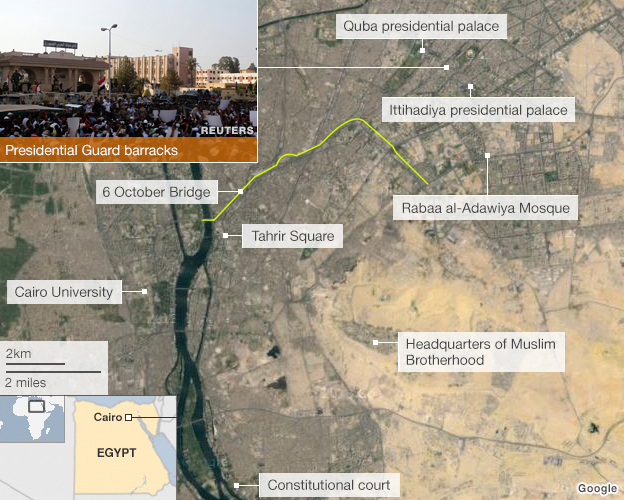 Monday’s battles erupted after hundreds of protesters, mostly members of Mr Morsi’s Muslim Brotherhood Islamist movement, blocked the Sixth of October bridge, a major route over the Nile and through the capital, and the nearby Ramses Square, a transport hub. Egypt’s troubled transition to democracy has also been a rocky road for the US. During the historic uprising of 2011, Washington vacillated over which side to back. Now, after the ousting of President Morsi, it is still criticised on both sides of a bitter Egyptian political divide. The anti-Morsi camp charges the US with backing the Muslim Brotherhood. The pro-Morsi camp accuses it of siding with the military. Recently, the US developed a good working relationship with the ruling Muslim Brotherhood but found itself increasingly drawn into the deepening crisis between Islamists and more liberal forces. The US now needs assurances that Egypt is still on the road to civilian rule, and its peace treaty with Israel is intact. If not, about $2bn, mostly annual military aid, will be at risk, as well as a vital relationship which, despite the strains, all sides still want to keep. State media quoted health ministry official Khaled al-Khatib as saying 261 people were injured in the clashes, which lasted into the early hours of Tuesday. Mr Khatib said 124 people were still in hospital. Mr Sultan said security personnel were among the casualties. 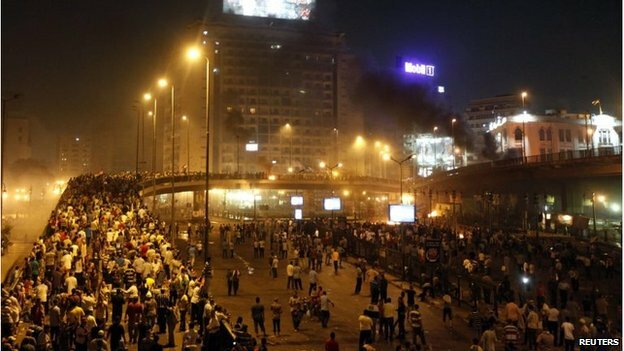 The clashes in Cairo broke out as supporters of the ousted president blockaded the Sixth of October bridge, a major route through the capital. But the Brotherhood has said it will not join a transitional government. Morsi supporters are demanding his reinstatement and have been holding a round-the-clock vigil outside the Rabaa al-Adawiya mosque, in the east of the capital, and at Cairo University in Giza. Large crowds were again gathered at the mosque on Monday as Mr Burns, the US deputy secretary of state, visited. “Get out, Sisi,” some shouted, referring to the head of the armed forces, General Abdel Fattah al-Sisi, who oversaw the overthrow of Mr Morsi. Mr Burns met interim President Adly Mansour and Prime Minister Hazem al-Beblawi, as well as Gen Sisi. He described the events of the last two weeks as a “second chance to realise the promise of the revolution” that ended the authoritarian presidency of Hosni Mubarak in 2011. He called on the military to avoid “politically motivated arrests”, saying the US remained committed to an Egypt that was “stable, democratic, inclusive and tolerant”. The US has stopped short of calling the army intervention a coup – doing so would trigger a legal stop of the some $1.5bn (£1bn) in the mostly military aid it sends to the country each year. But it has called for Mr Morsi to be released. He is being held at an undisclosed location and is being investigated on charges including inciting violence. A number of Brotherhood members have been arrested and warrants have been issued for many more. Mr Burns said he planned to meet religious and civilian leaders, the heads of political parties and business figures during his two-day visit. But both the ultra-conservative Salafi al-Nour party and the Tamarod anti-Morsi protest movement turned down invitations to meet Mr Burns, while the Muslim Brotherhood also said it had no plans to see him. “Such kind of visit doesn’t mean anything for us because we believe that America supported this military coup,” Dina Zakaria, a member of the Brotherhood and its political wing the Freedom and Justice Party, told the BBC.